Despite a downward trend in the prices at the pump, overall energy costs are rising. While most people could not quote the price they are paying per kilowatt hour—as they can for a gallon of gas, they do know their electricity bills are skyrocketing. They also understand that the government policy of picking winners and losers makes taxpayers the losers. As legislators fight to show their spending-cutting credentials, folks phoned their Senators in June and expressed enough ire that a Democrat-sponsored amendment easily won bipartisan support: by a margin of 73-27 the Senate voted to end ethanol subsidies. The Feinstein amendment was attached to a bill that did not pass and, therefore didn’t change anything. Its importance is mostly symbolic and represents more than just ethanol. People are paying attention. They are tired of paying subsidies for something that has been receiving taxpayer dollars for decades and will, hopefully, eventually, be cost-effective—but to date doesn’t make economic sense. In the midst of this anti-spending mood, the Obama administration and the Department of Energy (DOE) pushed through a subsidy with career-ending potential for elected officials who’ve repeatedly come out against such ploys. Instead, bureaucrats with no direct accountability have approved sending $4.5 billion in stimulus funds to one anointed industry (solar), in one golden state (California), and all to one lucky company (First Solar). Called a “loan guarantee,” the DOE, has agreed to back three First Solar projects in California. First Solar, a leading manufacturer of thin film photovoltaic—also known as thin-film solar panels, will build three solar power plants in Southern California using cadmium telluride rather than the more common silicon. (Cadmium is a toxic element, related to mercury and generally recovered as a byproduct from zinc mining, with long term safety and disposal issues.) First Solar has manufacturing facilities in Ohio, Germany, and Malaysia. The 20 million solar panels for the California power plants are scheduled to come from the Ohio plant and a new plant to be built in Arizona. Founded in 1999, First Solar began commercial production in 2002 and went public in 2005. Upon word of the DOE decision, their stock price increased. Should First Solar default on the loan, taxpayers will be on the hook for 80% of the $4.5 billion. Secretary of Energy, Steven Chu, touts the job creating benefits of the stimulus expenditure, “These projects will bring immediate jobs to California in addition to hundreds more across the supply chain.” The DOE press release states, “The projects will create a combined 1,400 jobs in California during peak construction.” So, maybe, the $4.5 billion will create 2000 short-term jobs. Do the math. These are some very expensive jobs—similar to the $278,000 per stimulus job created announced on July 1. No one is opposed to creating jobs, we know we need them. 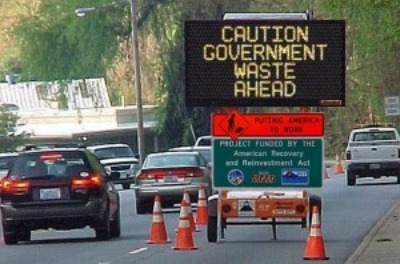 But throwing government (taxpayer) money at the problem is expensive and ineffective. In Massachusetts, Evergreen Solar, a solar panel manufacturer, received $58 million in state and federal grants, loans and land incentives. Evergreen was touted as the key to the state’s economic future in clean energy. The Devens, MA, plant employed 800 people—but they’re all out of work now. In little more than three years, all of the government money is gone, the plant is closed, and the state is stuck with the losses—but Evergreen Solar is not out of business. They are now manufacturing their solar panels in China. So much for job creation. All of this assumes that First Solar will actually be able to build the proposed solar generation plants and provide “green energy” for California. Despite the green moniker, history, once again, does not foretell and easy road. Due to the massive land use solar power requires per megawatt and the transmission issues related to remote siting, environmental groups who should be supportive, work to block the plants once they near reality. Even if the proposed plants do get built, the energy they provide will be more expensive and cost taxpayers/consumers more—as a soon to be released report from PNM (electricity power utility based in Albuquerque, NM) makes clear. Solar power is like rapidly-losing-favor ethanol in many ways. Both have been around for decades. Both make energy more expensive, and we pay for them two times: production and consumption. As we’ve done with ethanol, the public needs to demand that these “winners” stand on their own, or be exposed as whiners, and, if they qualify, get a real loan—from a bank, not taxpayers. Missing from this great article are any notes or references to Solyndra the 1/2 billion dollar taxpayer experiment gone terribly wrong under Chu/Obama as well.